Drupal security updates released on Wednesday address several vulnerabilities, including one that has been exploited in spam campaigns. The flaw exploited in the wild, patched with the release of Drupal versions 7.56 and 8.3.4, is a moderately critical access bypass vulnerability tracked as CVE-2017-6922. The problem is that files uploaded by anonymous users to a private file system can be accessed by all anonymous users, not just the user who uploaded them, as it should be. The security hole only affects websites that allow anonymous users to upload files to a private file system. Drupal has known about attacks exploiting this flaw since October 2016. At the time, it warned that misconfigured websites had been abused by malicious actors to host files and point users and search engines to them. The latest updates for Drupal 7 and 8 introduce a protection that should prevent exploitation. “For example, if a webform configured to allow anonymous visitors to upload an image into the public file system, that image would then be accessible by anyone on the internet. The site could be used by an attacker to host images and other files that the legitimate site maintainers would not want made publicly available through their site,” the Drupal Security Team said in its October 2016 advisory. Drupal 8.3.4 also patches a critical issue related to how the PECL YAML parser handles unsafe objects. An attacker can exploit the flaw, tracked as CVE-2017-6920, for remote code execution. Another vulnerability fixed in Drupal 8 is a less critical improper field validation bug (CVE-2017-6921). “A site is only affected by this if the site has the RESTful Web Services (rest) module enabled, the file REST resource is enabled and allows PATCH requests, and an attacker can get or register a user account on the site with permissions to upload files and to modify the file resource,” Drupal said in its advisory. The Drupal Security Team warned users in mid-April that a serious vulnerability affected a third-party module named References, which had been used by more than 121,000 websites. The module had no longer been supported and Drupal initially advised users to migrate to a different product. However, a new maintainer took over the project shortly after and the flaw was addressed. Every time a new topic trends on the Internet, scammers take advantage of it. You must have heard of Bitcoin and how in recent days it has made some early investors millionaire overnight. Yes, the Bitcoin boom is back, and it's real — a digital currency that has just crossed a new milestone today. The current price of 1 BTC or 1 Bitcoin = US$2,850. An American con man took advantage of this boom in Bitcoin market to run bogus bitcoin mining schemes and earn millions of dollars. But the bogus schemes ended as the United States Securities and Exchange Commission (SEC) has won a legal battle against two bogus, but now defunct, Bitcoin companies operated by Homero Joshua Garza — GAW Miners and ZenMiner. Garza is now facing a $12 Million (£9.2 Million) penalty for running the bogus schemes – what lawmakers have certified was a "Ponzi scheme." According to the SEC, Garza used the "lure of quick riches" in order to get people to invest in the bitcoin mining schemes, which means those who add their computing power to help verify transactions, a practice known as mining, are rewarded with Bitcoins. Garza's GAW Miners and ZenMiner purported to provide shares in cloud-based Bitcoin mining machinery, but nothing like that was ever built by the operator. Garza told investors that he had enough computing power to mine a lot of bitcoins on their behalf and share the proceeds, but in reality, he just used cash from new investors to reward earlier joiners, which is nothing but a fraudulent "ponzi" scheme, according to the SEC. The SEC said: "Most investors paid for a share of computing power that never existed." It also said that about 10,000 investors joined the bogus schemes and handed over $20 Million to Garza. Few got back their money they invested, but many left without a single penny. The complaint against the Bitcoin mining schemes was filed on 1 December 2015, and on June 2, the US District of Connecticut federal court sided with the SEC, ordering both GAW Miners and ZenMiner to pay a combined of $10,384,099 in disgorgement and prejudgment interest, along with $1,000,000 in damages. Both GAW Miners and ZenMiner companies have now been shut down. However, a ruling is yet to be made on the Bitcoin funds collected by Garza. In 2014, when Garza was running the bogus schemes from his home in Connecticut, 1 BTC was equal to $450, and today it is around $2,800. So, the $20 Million funds Garza took from the investors today worth around $150 million. The Federal Bureau of Investigation report reveals that Business email compromise scams caused losses to businesses for 5 billion dollars over four years. Business email compromise (BEC) continues to be a profitable attack technique for crooks and a serious threat to businesses. The FBI has published data related to this specific criminal practice, and financial figures are astonishing. The fraud scheme is very simple, busy employees receive a request to transfer funds by representatives of high management of their company. The request could be sent by an attacker that either compromises a company’s email accounts or sets up a phishing message that submits a fake invoice to the victim from someone posing as a contractor or business partner. It is clear that businesses and personnel using open source e-mail are most targeted by Business Email Compromise, in many cases the criminals spoofed e-mails of individuals within enterprises who are entitled to submit such payment requests. Individuals responsible for handling wire transfers within specific companies are privileged targets of criminals which compose well-worded e-mail requests for a wire transfer. The attacker behind Business Email Compromise scams shows a deep knowledge of their victims, their requests are proportional to the economic capabilities of the target and of the specific individual used as the sender of the request. The criminals sent e-mails concurrently with business travel dates for executives whose e-mails were spoofed. Data provided by the FBI is related to BEC crimes occurred between 2013 and December 2016, cyber criminals have earned $5,302,890,448 from 40,203 cases involving US and international businesses. The FBI also confirmed that BEC scams continue to increase, 2,370 percent over the past year. The FBI set up a reporting site for BEC scams and observed that between June and December of last year, US businesses reported losses of $346,160,957 in 3,044 attacks. In the same period, non-US businesses reported losses of $448,464,415, but the overall number of BEC scams was much lower: 774. These data confirm that BEC scams are an emergency for US firms. “The BEC/EAC scam continues to grow, evolve, and target small, medium, and large businesses. Between January 2015 and December 2016, there was a 2,370% increase in identified exposed losses. The scam has been reported in all 50 states and in 131 countries. Victim complaints filed with the IC3 and financial sources indicate fraudulent transfers have been sent to 103 countries.” states the Alert published by the FBI. Stolen funds were mostly diverted to Asian banks located in China and Hong Kong, but Feds also confirmed that the use of British banks is on the rise. The FBI report highlights that many recent attacks were preceded by a malware-based attack, mainly ransomware, likely because the crooks evaluate the ability of the firm to pay. The FBI confirmed an increase of Real estate scams (+480 percent respect 2016). Out-of-Band Communication: Establish other communication channels, such as telephone calls, to verify significant transactions. Arrange this two-factor authentication early in the relationship and outside the e-mail environment to avoid interception by a hacker. Digital Signatures: Both entities on EACh side of a transaction should utilize digital signatures. This will not work with web-based e-mail accounts. Additionally, some countries ban or limit the use of encryption. Give a look at the report, it is full of interesting data. Researchers from security frim RiskIQ recently discovered a large ad scam operation where cybercriminals employed advanced automation techniques to deliver scam ads from millions of different domain names. Dubbed NoTrove, the threat actor managed to stay ahead of detection and takedown efforts, while also building a network that generated huge amounts of traffic. The group was first observed a year ago, but the security researchers believe that it has been operating since at least 2010. NoTrove was mainly focused on getting as much web traffic as possible, for monetary gain, and RiskIQ associated the group to 78 campaigns, including scam survey rewards, fake software downloads, and redirections to PUPs (Potentially Unwanted Programs). Although the used domains were short-lived, the generated traffic from scam ad deliveries was so large that it even pushed one of them to a 517 ranking on the Alexa top 10,000 web sites. The actor was observed switching between 2,000 randomly generated domains and more than 3,000 IP addresses, operating across millions of Fully Qualified Domain Names (FQDNs). An FQDN is a complete web address, typically including subdomains for ad scammers, RiskIQ security researchers explain in their report (PDF). The NoTrove FQDNs show high-entropy (they are highly random hosts), which shows that automation was used when creating them. Next to the high-entropy hosts, the researchers identified campaign-specific middle hosts, which appear to label the type of scam employed in the campaign, along with high-entropy or randomly worded domains, also generated using automation. “With high-entropy domains and always-shifting hosting, we’ve seen NoTrove burn through just under 2,000 domains and over 3,000 IPs. Combined with the 78 variations of campaign-specific middle word variants and randomized hostnames, we’ve seen NoTrove operate across millions of FQDNs. Typically, one IP used by NoTrove will house a set of domains, but each campaign-specific *.domain.tld campaign variant will be hosted on its own IP, usually a Choopa or Linode droplet,” the researchers say. “NoTrove harms not only visiting users, but also legitimate advertisers, adversely affecting those reliant on the credibility of the digital advertising ecosystem such as online retailers, service providers and media outlets. Constantly shifting infrastructure means simply blocking domains and IPs isn't enough. We must now begin utilizing machine learning to leverage human security teams who increasingly depend on accurate, automated scam detection,” RiskIQ threat researcher William MacArthur said. A Lithuanian man has been indicted in the United States for convincing two U.S.-based Internet companies into wiring over $100 million to bank accounts he controlled as part of an email fraud scheme. Evaldas Rimasauskas, 48, was arrested late last week in Lithuania on the basis of a provisional arrest warrant, the New York Office of the FBI said. The indictment (PDF) claims that Rimasauskas has orchestrated a fraudulent scheme in or around 2013 through in or about 2015, to deceive targeted companies, including a multinational technology company and a multinational online social media company, into wiring funds to bank accounts he controlled. Rimasauskas registered a company in Latvia with the same name as an Asian-based computer hardware manufacturer, and also opened, maintained, and controlled accounts at banks in Latvia and Cyprus in the name of this company. Then, he started sending fraudulent phishing emails to victim companies – which regularly conducted multimillion-dollar transactions with the legitimate manufacturer – to direct money these companies owed for legitimate goods and services to the accounts he controlled. As soon as the victim companies wired money to his accounts, Rimasauskas quickly transferred the funds to different bank accounts in various locations throughout the world, including Latvia, Cyprus, Slovakia, Lithuania, Hungary, and Hong Kong. Further, the individual “caused forged invoices, contracts, and letters that falsely appeared to have been executed and signed by executives and agents of the Victim Companies, and which bore false corporate stamps embossed with the Victim Companies’ names, to be submitted to banks in support of the large volume of funds that were fraudulently transmitted via wire transfer,” U.S. Attorney’s Office, Southern District of New York, says. Over the course of the scheme, these false and deceptive representations resulted in Rimasauskas causing victim companies to transfer a total of over $100,000,000 in U.S. currency to the accounts he controlled. Rimasauskas is charged with one count of wire fraud, three counts of money laundering (each carries a maximum sentence of 20 years in prison), and one count of aggravated identity theft. The maximum potential sentences will be determined by the judge. “From half a world away, Evaldas Rimasauskas allegedly targeted multinational internet companies and tricked their agents and employees into wiring over $100 million to overseas bank accounts under his control. This case should serve as a wake-up call to all companies – even the most sophisticated – that they too can be victims of phishing attacks by cyber criminals. And this arrest should serve as a warning to all cyber criminals that we will work to track them down, wherever they are, to hold them accountable,” acting U.S. Attorney Joon H. Kim said. A few days ago the experts Chris Vickery announced that he will reveal the source of a massive data leak. Now he said it is from world’s biggest spam networks. A few days ago the popular cyber security expert Chris Vickery from security firm MacKeeper announced that he will shortly reveal the source of a huge data breach impacting individuals. The huge archive contains 1.4 billion email addresses, names, physical addresses and IP addresses. For sure it will be one the largest data breach of 2017. Vickery also offered a teaser of the leak, also reducing the number of identities by 30,000. Security experts made several hypotheses about the name of the alleged victim of the data breach, one of them was the Aadhaar, the world’s largest biometric ID system, with over 1.123 billion enrolled members as of 28 February 2017. The Unique Identification Authority of India (UIDAI) promtly denies their archive was the source of the leak. Vickery shared the data with the expert Steve Ragan from Salted Hash and discovered an unsecured repository of backup files linked to a notorious spamming organization called River City Media (RCM). “This is the story of how River City Media (RCM), Alvin Slocombe, and Matt Ferris, accidentally exposed their entire operation to the public after failing to properly configure their Rsync backups.” reported Salted Hash. The huge archive includes sensitive information about the operations of the River City Media, a company that claims to be a legitimate marketing firm, but that is the source of billion spam messages per day. What about the spamming business? No doubts, spamming operations are very profitable.? The River City Media company used many illegal hacking techniques to target send spam messages to as many users as possible. One of these techniques is the Slowloris attack, a method that is used to paralyze a web server rather than subvert it in this manner. “Purposely throttling your own machinery to amass open connections on someone else’s server is a type of Slowloris attack [https://en.wikipedia.org/wiki/Slowloris_(computer_security)]. The twist here is that the spammer is not trying to completely disable the receiving server, he is only temporarily stressing the resources in order to overwhelm and force the processing of bulk email.” Vickery explained in a blog post. Vickery defined illegal the hacking activity of the RCM due to the presence of scripts and logs enumerating the groups’ many missions to probe and exploit vulnerable mail servers. The leaked backusp include chat log in which personnel at the company admit and describe the adoption of hacking methods. The expert has shared details of RSM’s operations with other parties, including Microsoft, Apple, Salted Hash, Spamhaus and of course law enforcement. To block the activity of the group, Spamhaus announced the blacklisting of the entire infrastructure used by the RCM from its Register of Known Spam Operations (ROKSO) database. The service tracks professional spam campaigns. Chris Vickery discovered many other clamorous cases of open database exposed on the Internet. In December 2015 the security expert discovered 191 million records belonging to US voters online, in April 2016 he also discovered a 132 GB MongoDB database open online and containing 93.4 million Mexican voter records. In March 2016, Chris Vickery has discovered online the database of the Kinoptic iOS app, which was abandoned by developers, with details of over 198,000 users. In January 2017, the expert discovered online an open Rsync server hosting the personal details for at least 200,000 IndyCar racing fans. What's worrisome? There are high chances that you, or at least someone you know, is affected by this latest data breach. Security researcher Chris Vickery of MacKeeper and Steve Ragan of CSOOnline discovered an unsecured and publicly exposed repository of network-available backup files linked to a notorious spamming organization called River City Media (RCM), led by notorious spammers Matt Ferrisi and Alvin Slocombe. The database contains sensitive information about the company's operations, including nearly 1.4 Billion user records, which was left completely exposed to anyone – even without any username or password. Besides exposing more than a billion email addresses, real names, IP addresses and, in some cases, physical addresses, the leak exposed many documents that revealed the inner workings of RCM's spam operation. "The situation presents a tangible threat to online privacy and security as it involves a database of 1.4bn email accounts combined with real names, user IP addresses, and often physical address," Vickery said. "Chances are that you, or at least someone you know, is affected." Vickery wasn't able to fully verify the leak but said he discovered addresses he knew were accurate in the database. Wondering how spamming operations can be profitable? One leaked text shows a single day of activity of RCM that sent 18 million emails to Gmail users and 15 million to AOL users, and the total take of the spamming company was around $36,000. "[Slowloris is] a technique in which the spammer seeks to open as many connections as possible between themselves and a Gmail server," Vickery writes in a blog post published today. "This is done by purposefully configuring your own machine to send response packets extremely slowly, and in a fragmented manner, while constantly requesting more connections." In response to the latest discovery, Spamhaus will be blacklisting RCM’s entire infrastructure from its Register of Known Spam Operations (ROKSO) database that tracks professional spam operations and lists them using a three-strike rule. A company run by a couple of known spammers has unknowingly leaked a series of files containing sensitive information about its operations, including nearly 1.4 billion user records. River City Media (RCM), which claims to be a legitimate marketing firm, is run by Matt Ferris and Alvin Slocombe, both listed in Spamhaus’ Register of Known Spam Operations (ROKSO). Slocombe is said to be involved with the bulletproof spam host Cyber World Internet Services, which is believed to have launched spam campaigns using aliases such as Ad Media Plus, RCM Delivery, eBox, Brand 4 Marketing and Site Traffic Network. MacKeeper researcher Chris Vickery, who has made a name for himself after finding misconfigured databases exposing large amounts of potentially sensitive data, discovered a freely accessible Rsync backup belonging to River City Media. The leaked data has been analyzed by Vickery, Spamhaus, and IDG’s CSO Online. Law enforcement has also been alerted as some of the exposed files appear to contain evidence of illegal activities. Tech giants such as Microsoft and Apple have also been notified. According to Vickery, the leaked data includes documents (e.g. financial data), backups and chat logs. 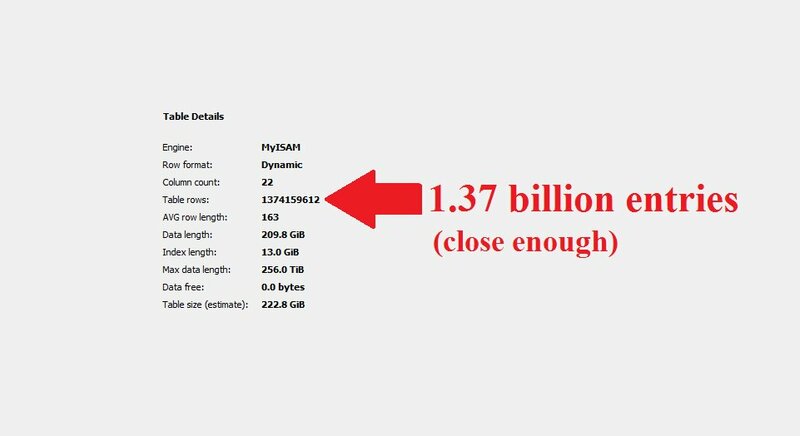 One of the most interesting files is a database containing 1.37 billion user records, including names, email addresses, physical addresses and IPs. The expert, whose investigation showed that much of the data appears to be valid, believes the vast amount of information was collected by the spammers through credit checks, sweepstakes, education opportunities and other similar activities. The exposed data, which Vickery believes will lead to the downfall of this “spam empire,” also includes information on the illegal tools and techniques used by RCM. For example, one of the leaked files describes a technique leveraged by the spammers to target Gmail servers by opening as many connections as possible between them and the targeted server.